To take advantage of online bill payment, you have to set up your bank account. Once everything is dialed in, life is easy going forward. Find out what it takes to set up online bill payment at your bank. This page only covers steps to pay bills from your bank account. If you want to set up online bill payments directly with your service provider (called ACH debit), you’ll need to follow instructions on their website. First, you’ll need to find where to pay bills on your bank’s website. Often you just click a link or tab that says 'Pay Bills'. When you make an online bill payment, who does it go to? The recipient (your service provider) is called a 'payee'. Click a link that says something like 'Add Payees' or 'Manage Payees'. Some online bill payment systems recognize payees just by their name and zip code. They complete some of the information for you (like exactly who the check should be made payable to) and you just have to enter your account number. After you create a payee, you should verify that everything is accurate. 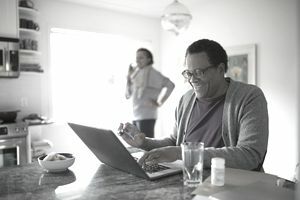 In future months, you’ll breeze through online bill payment without double-checking mailing addresses and account numbers - so take the time to do it now. You don’t want to send checks to a stranger (or to somebody else’s account) do you? Some payees may have a relationship with your bank. They may be able to send your bill to the bank electronically. From there, you can either pay the bill manually or authorize the online bill payment system to pay each bill automatically. You can also set up automatic recurring payments. For example, you know what your mortgage payment is and when it’s due each month, so you can put the payments on auto-pilot. Online bill payment can make life easy, but you shouldn’t ignore your accounts. Check in regularly to see that you have sufficient funds and make sure you can make sense of every transaction in the account. You might make sure you have overdraft protection in case a payment goes through and your account is emptied. The least expensive form of overdraft protection is generally an overdraft line of credit. Now that your online bill payment system is set up, you can enjoy the benefits. Each month, you should be able to just log in to your account, click on a payee, and enter a payment amount. The bank takes care of everything else.